Rajasthan in India - the state of forts and historical monuments is a temptingly inviting tourist destination. We chose to do just the 7 day Mewad sector for now as the Mewad - Marwad sector for 15 days would be too taxing. And it did prove to be a wise decision - a word of caution to tourists with Rajasthan on their mind - the earlier you undertake this tour (before health issues develop), the better, as it is a bit taxing. Our itinerary included Mt. 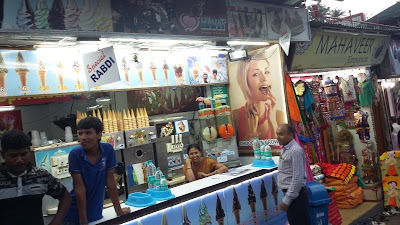 Abu, Udaipur, Ajmer, Pushkar and Jaipur. We took the flight along with 31 more guests with Veena World from Mumbai to Ahmedabad. 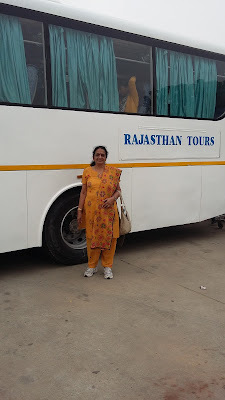 From there, our journey to Rajasthan was in a luxury coach. 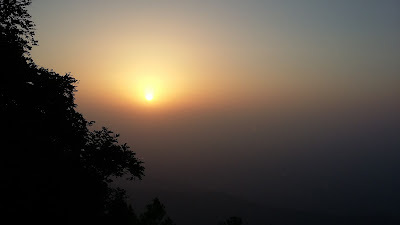 After a 4 hour drive, part of it through ghat section, we reached Mt. Abu, a quaint little town, the only hill station in Rajasthan. The roads were steep and narrow but our driver was an expert at maneuvering the bus around. Checking in at our rooms in Maharaja Hotel, we relaxed a bit and were ready to take a walk around the town after tea. 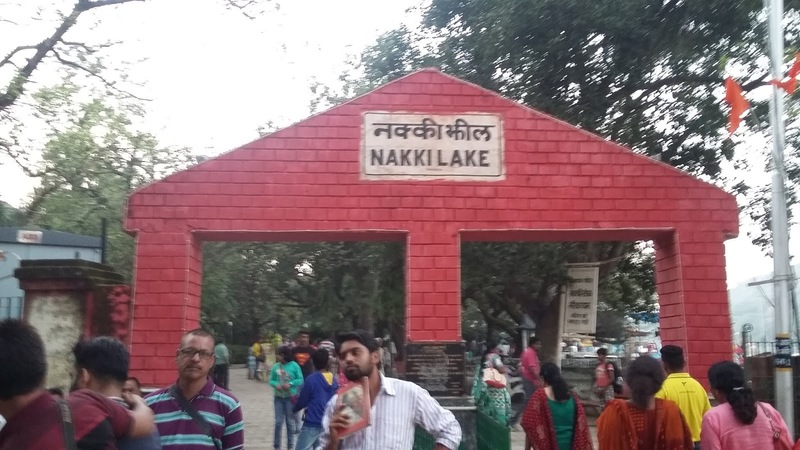 As we walked down to Nakki Lake, we ladies could not help our eyes greedily flitting from one tiny shop to another ... and the young sales boys promptly pounced on the prospective preys and lost no time canvassing for their respective shops. 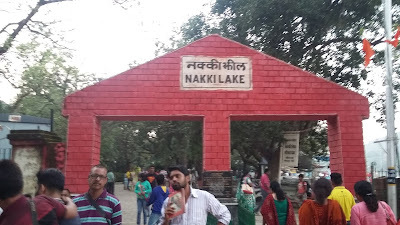 We were in a hurry to have a good view of the famed Nakki Lake before sunset, so we escaped from their clutches. Within five minutes we were at the lake; at first glance it was a big let-down as the water was dark and dirty. 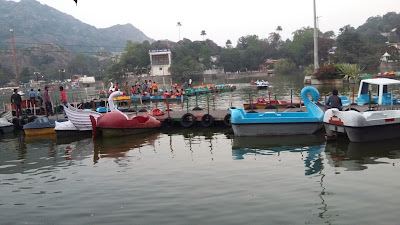 But we saw people going on boat rides. I didn't fail to notice the Toad Rock in the background. 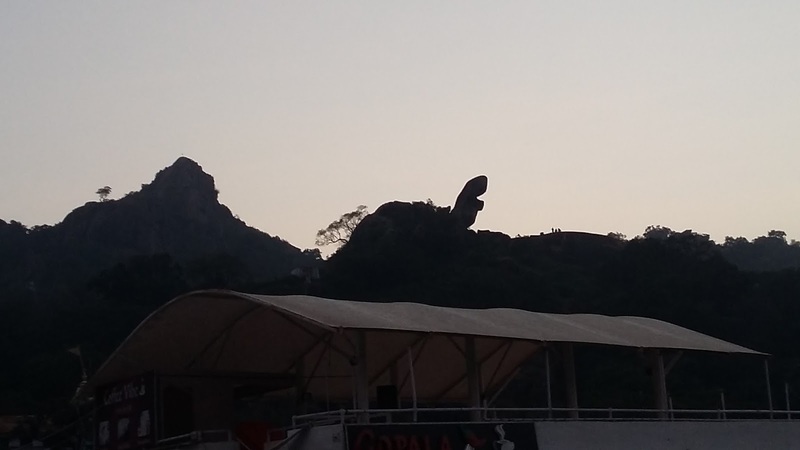 Doesn't it look more like a turtle? After sunset, we ladies started walking back in batches as we had shopping plans, letting our husbands wander on their own as they wouldn't have the patience to sit through our bargaining sessions. We had been instructed by our tour Manager that stuff are generally expensive here as they get things from other cities - so bargain we must! But in case we liked something very much, we should procure them - for all you know, we might not find them anywhere else. Very useful advice it turned out to be. We ladies had the time of our lives bringing the price to half and then raising it to two thirds and getting good deals. 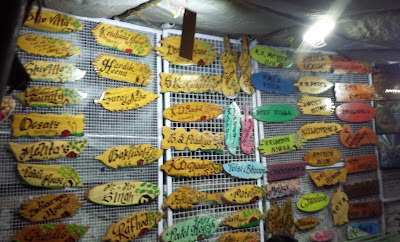 There were wooden nameplates - personalized ones - for less than a hundred bucks. Things seemed to be rather cheap - I managed to get a kid's crochet skirt-n-top for just Rs. 200. I was debating whether to get another set but then decided to try another city later; also why saddle ourselves with a lot of stuff on the very first day! I need to admit that we didn't find these items in any other city we visited! 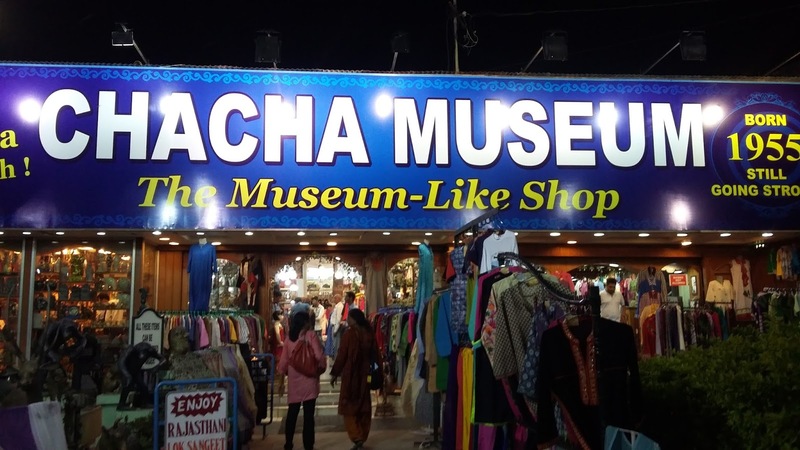 Of course we enjoyed looking around the handicrafts stores and checking out the items and their prices. 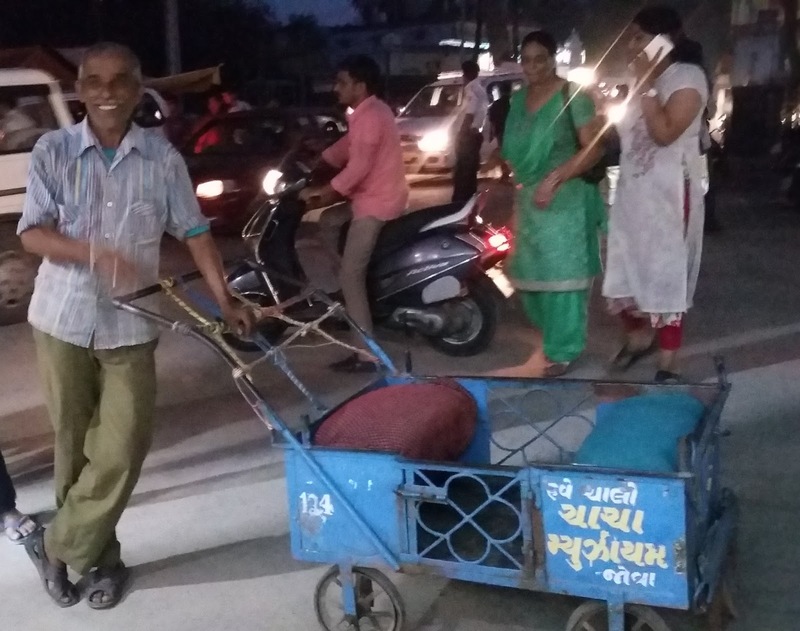 One interesting feature we noticed was the 'Baba Gaadi' - a sort of a 4-seater push-cart. 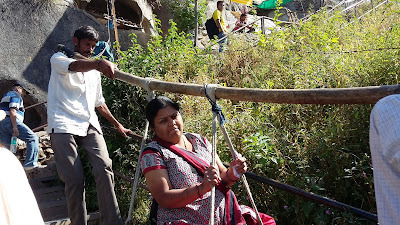 Old people having a problem walking up the steep road could avail the services for a reasonable fare. Actually we came across more of these the next day at Sunset Point. 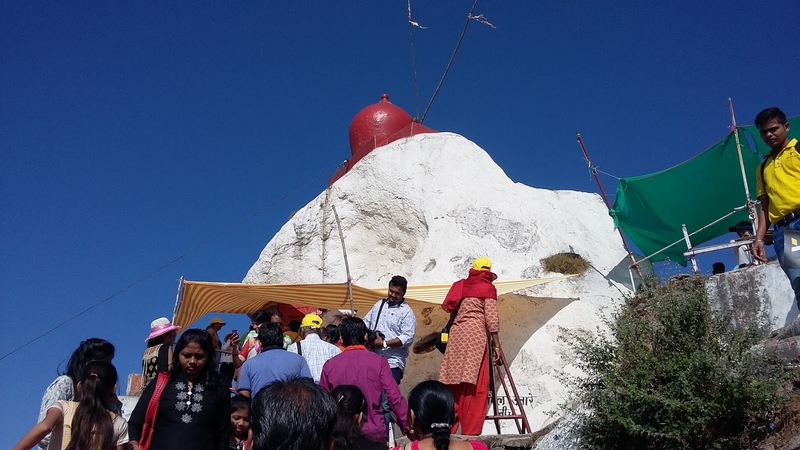 The next day we started for Guru Shikhar, 15 km from Mount Abu, which is located at a height of 1722 metres and is the highest point of the Aravalli Range. We went in 6-seater Taveras as our luxury coach would not go on those steep, narrow roads. A short 15 km drive from Mt. Abu took us to the bottom of the hill. We were warned that we would have to climb more than 260 steps to the top. Some from our group availed the 'doli' / 'palki' (modest palanquin) services; others walked up valiantly, taking intermittent breaks at places to sit by and relax and enjoy the scenic beauty and fresh air before proceeding. After about 190 steps we were at the first halt at the Mandir. After darshan, we had to go further up - some 70 steps for darshan at the 'Datta Mandir'. Those weak in their knees - literally - opted to wait for us there itself at the 'tea stall'. 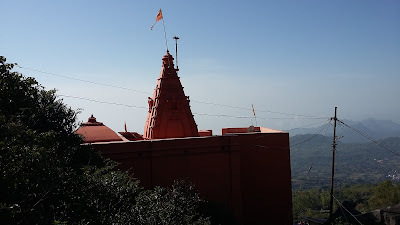 We reached Guru Shikhar ('the peak of the guru') named after Dattatreya. Many Hindus in the Western Indian regions believed that Dattatreya is a God, an incarnation of the Divine Trinity Brahma, Vishnu and Siva. 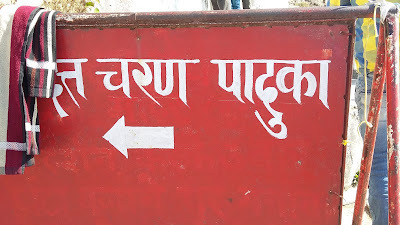 The word Datta means "Given," Datta is called so because the divine trinity had "given" themselves in the form of a son to the sage couple Atri and Anasuya. plus one dedicated his mother, Anasuya on another hillock. We were informed that the ashes from the place of worship done by the old saint ages ago is said to have healing power. 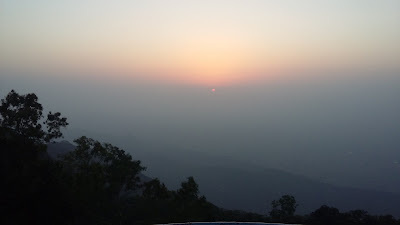 From atop, we got breathtaking views around - including that of the Mt Abu Observatory operated by the Physical Research Laboratory hosting a 1.2 m infrared telescope and also several Astronomy experiments. The climb down was easy as expected. 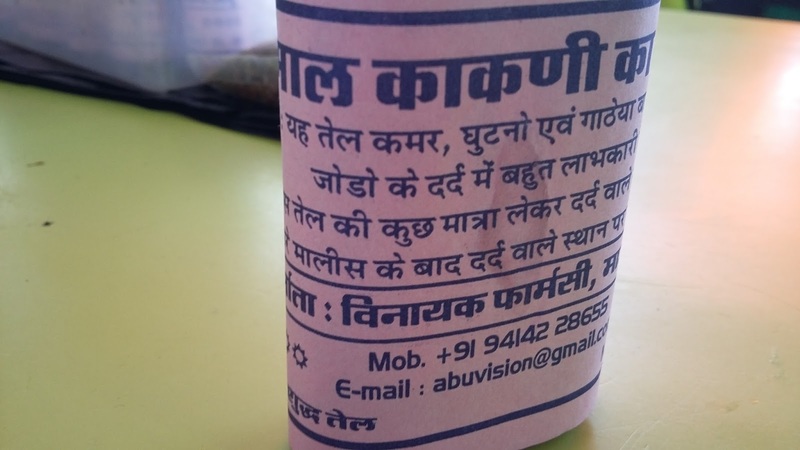 At the small cafe there was more than hot tea for sale; specially popular was a special herbal oil for Rs 100 for a 100 ml bottle for relief from joint pain. There were quite a few takers - for themselves or for the elders at home. Our next halt was Brahmakumaris World Peace Hall. A calm, peaceful atmosphere pervaded the place. The unique attraction is the huge hall built without any columns - with a seating capacity of around 50,000! Volunteers enlightened separate groups about the Brahmakumaris and their mission. 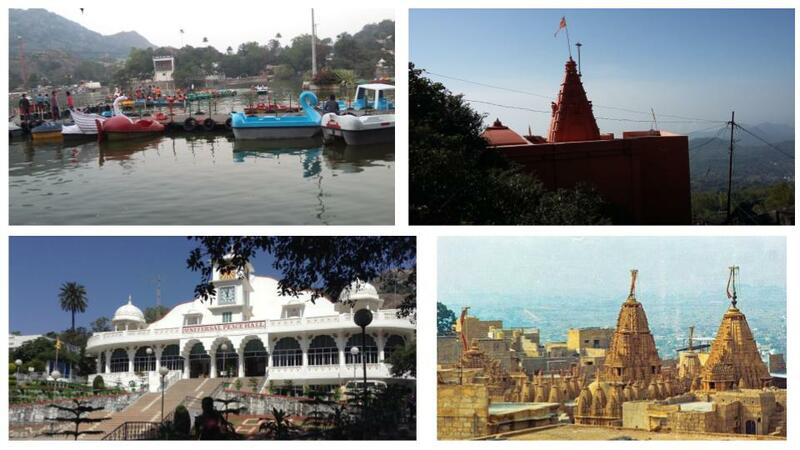 After lunch and a short rest, we undertook the 20 minute drive to the famed Dilwara Jain Temples. 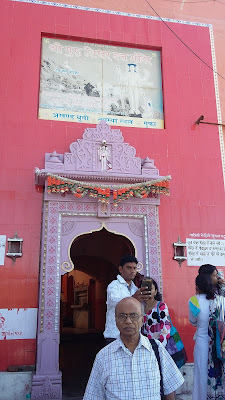 We were instructed that photography was strictly prohibited inside and were advised to leave everything in the bus - including purses and mobiles and cameras. 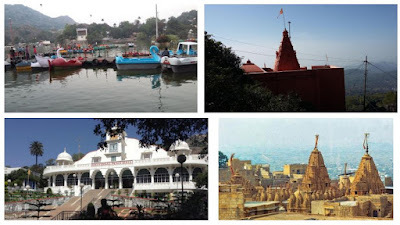 The Dilwara temples of India famous for their architectural perfection are located about 2½ kilometres from Mount Abu. 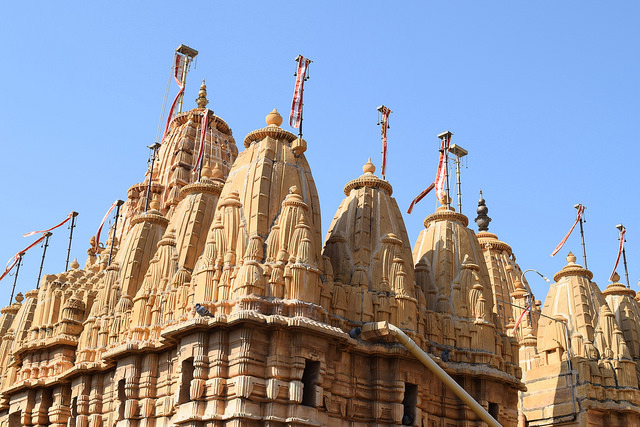 These Jain temples were built by Vastapul Tejpal, a Jain laymen between the 11th and 13th centuries AD and are world-famous for their stunning use of marble. The five legendary marble temples of Dilwara are a sacred pilgrimage place of the Jains. The temples are in the midst of a range of forested hills and a high wall shrouds the temple complex. We had a good guide who explained the features of each temple. Facilities are available for bathing, which is mandatory before puja is performed for the idols. These facilities use passive solar power to heat up the water for bathing and other things. Guided tour hours for tourists are posted outside the temple. 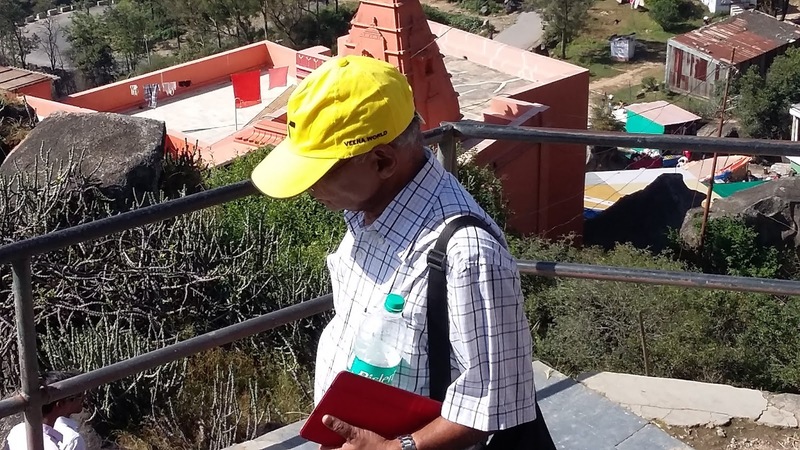 The temples have undergone repairs time to time. Extensive repairs were again undertaken during 1950-1965. The older marble is yellowish, whereas the newer marble is white. We were totally bowled over by the intricate marble carvings all around - on the pillars, walls, ceilings - the jhoomers (chandeliers), figurines, flora and fauna, the 'kalpavriksha' ..... Again two temples - almost identical - built for the two warring queens.... We could not have enough of the place ... such artistry surviving for more than 500 years - incredibly awesome. Everyone of us had the same thought running in our mind - 'paisa vasool' for this tour! After spending an hour there, we came out - there were little souvenirs for sale but many of us didn't have our purses ...! Our next halt was at Sunset Point. We had to walk more than a kilometre to take up vantage points atop hillocks to watch the sunset. The 'Baba Gaadi' fellows were after us - even pleading with us to avail these as this was their bread and butter. Their emotional blackmail was snuffed out by our respect for human dignity. Also it was the usual evening walk for many of us. A few shared a 'Baba Gaadi' at Rs.50 per head. The more adventurous lot chose to ride on a horse at Rs. 100 per person - just for the thrill. So as you see, we had access to so many modes of travel on that single day - including 'doli', 'baba gaadi', 'horseback' etc. 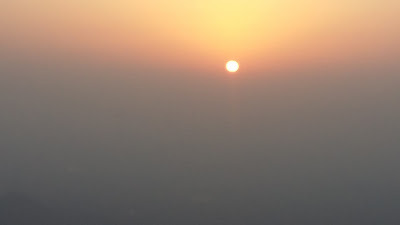 We climbed a hillock and seated ourselves, striking up conversations with our group members as we waited for sunset. We also enjoyed 'chai' and boiled 'butta' (corn-on-the-cob). Around 6 pm, the sky was splattered with hues of orange and pink as the sun chose to bid goodbye for the day. 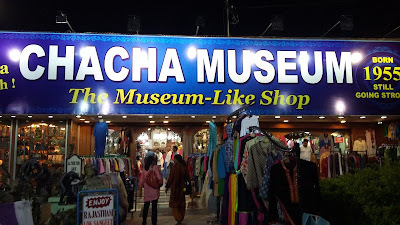 And we walked back to our bus and reached the hotel - but we still managed to find time to hunt for a few souvenirs because we were leaving this quaint town the next morning for Udaipur.